When I was in middle school, I dreamed of writing an amazing fantasy novel. It had everything: teenagers on the verge of discovering something new, dragons, and even a secret society complete with hooded robes. But when I sat down in front of the computer to write it, I never even got through the first chapter. Twenty years later, I finally know what the problem was. I was typing it instead of writing it. Don’t get me wrong. Typing is the most efficient way of doing things. As a freelance writer, I type anywhere from 5-10,000 words per day. I could never do that by hand. But the inspiration for all those keyboard clicks comes from writing by hand. When I need a new plot or character details and I sit down with a notebook, I tap into something that is completely inaccessible when I’m on the computer. I’ve read articles before about how the process of writing by hand works well because your brain has time to keep up with your fingers. Maybe that’s it, or maybe it’s some sort of magic voodoo that can only be cast by the spilling of ink. I don’t know, but it works. Of course, this all means that I am a total sucker for a good pen and a nice notebook. Since I’m ridiculously cheap and living on an artist’s budget anyway, I settle for decent pens. The truly nice ones are only the ones that are given to me for birthday or Christmas presents. 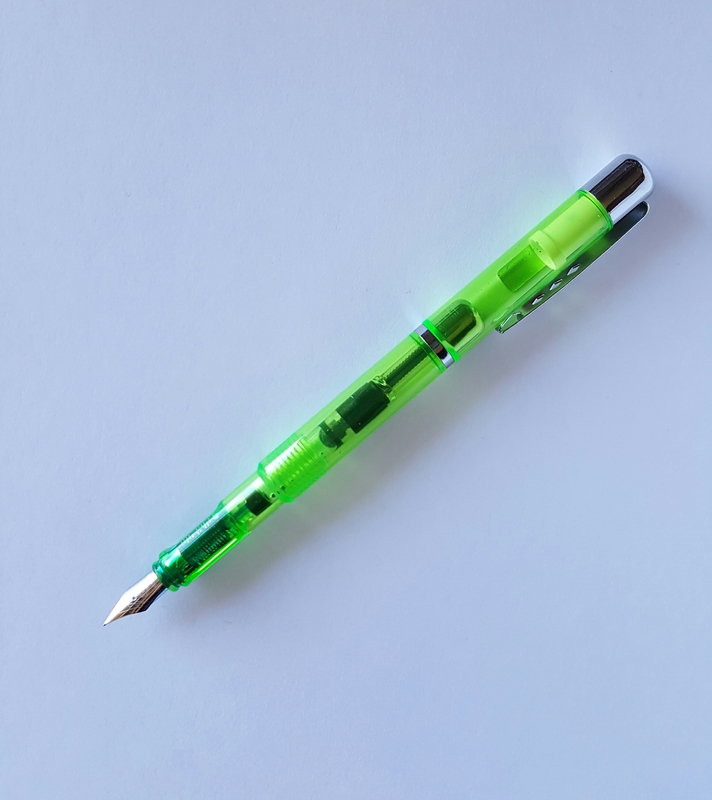 I like a pen that feels good in the hand and flows well, so that’s pretty much either ball point or gel. All of that changed when I got my first iPen subscription box. Each box includes a fountain pen (and a lot of other cool stuff, too). While I was crazy excited to get this box, the fountain pen was the part I was seriously doubting. Who writes with a fountain pen? It can’t flow as nicely as a gel pen or a smoothly as a ball point, and the results are going to be impossible to read since I’m not a calligrapher. I’m still not a calligrapher, but I was so wrong about the fountain pen. The Wing Sung Demonstrator that came in my box doesn’t look like much, but it writes like a dream! I had other typey-typey work I should have been doing, but instead I messed around with learning how to fill this pen so I could use it for some character creation. The Demonstrator came with a very fine nib (that’s the pointy part where the ink comes out) and it is so amazing! The ink flows freely and evenly, without any big splotches to make it look like some historical document. The case of the pen is just plastic, but it’s molded nicely at the grip. I had never filled a fountain pen before, so it took a few minutes and I got a little ink on my hands, but I’m in love. *This post was in no way sponsored or endorsed by the iPenStore. If you enjoyed yourself while you were here, make sure you come find me on Facebook or Twitter, or check out my books on Amazon! I used to practice calligraphy when I was younger and appreciated a good pen. I am very similar to you that I may blog on my keyboard but many times I feel inspired when I write by hand. There’s definitely something awesome about it! Thanks for visiting my blog and especially Thank You for becoming my first follower! I’m happy to find a new convert to Fountain Pens. I loved your blog entry and learned about the iPen subscription box, thanks. For me the attraction was all the colors that are available no longer constrained to the ternary of only Blue or Black ballpoints. 🙂 Check the swab shop at https://www.gouletpens.com/swab-shop. so many colors so little shelf space.